James and Lee Gonzales will be vendors at the upcoming 2018 Helzarockin’ Gem & Mineral Show October 12-14 in Historic Downtown Buckeye, Arizona. 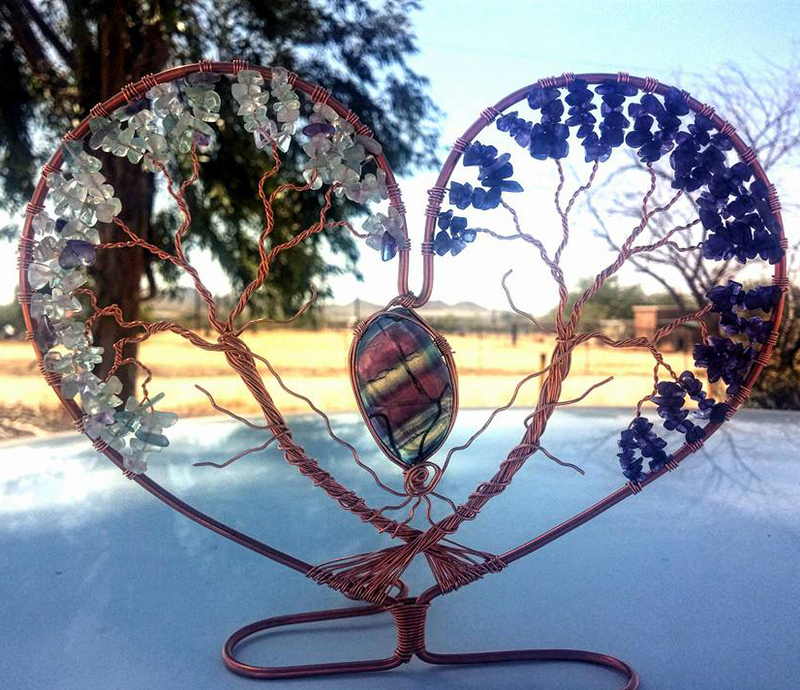 I spoke with Lee recently to learn where her inspiration for wrapping copper and threading gemstones to make her sought after jewelry and art. Lara: Do you cut and polish stones? Lee: My Dad who was a rock hound, taught me lapidary and silversmithing at age 10. For 5-6 years, I did do my own lapidary and silversmithing work. When I was a teenager, we had a house fire just before the big January Rock and Gem show in Phoenix. Our house burnt to the ground on Christmas and we lost everything, including our lapidary equipment and supplies. We never got back into lapidary because of the cost. It’s something I would like to get back into. I just buy my cabs now. Lara: Your father was a rock hound, tell me about him. Lee: He was from New Jersey and moved out to Arizona in 1963. He loved the desert. He bought himself a jeep and every weekend we as a family would pick a new place and go rock hounding. Lara: Did you always live out here in the West Valley? Lee: I was born in New Jersey, my parents moved out here when I was 3. We originally moved to Paradise Valley, Arizona and then my parents bought a piece of property in Rainbow Valley. I have lived in Rainbow Valley, Arizona since 1968. Lara: Did your family ever go rock hounding with the Koning family from Morristown? Lee: My Godfather moved out here a few years after we did, and he had bought a small claim that was part of the Vulture Mine. We would go out in the Wickenburg area all the time for rock hounding. There used to be a rock shop in Glendale, AZ where we always went. Lara: Did your family belong to a rock hounding club then? Lee: Yes, but I don’t remember the name of it. The club came out of the Glendale Rock Show. We’d get together on weekends, much like your West Valley Rock & Mineral Club. Lara: Talk abut your Pale Tail Visions work. Lee: I have all different types of earrings, necklaces, beaded bugs and trees of life that can set in a window, hang on a wall or your person. Lara: What’s your biggest seller? 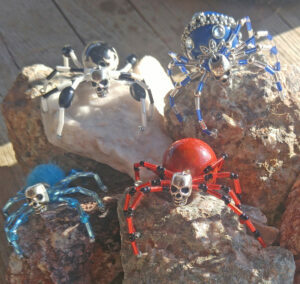 Lee: The beaded spiders are most popular. 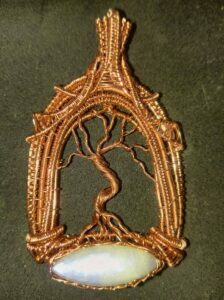 The trees of life come in second. The spiders draw attention. Customers may not always buy depending on funds or time of year, but they always stop and look. My prices are pretty reasonable. Everybody can afford a spider whether they like them or not. Lara: What started you making beaded spiders? Lee: For the last 25 years, my husband and I make Christmas gifts for each other. 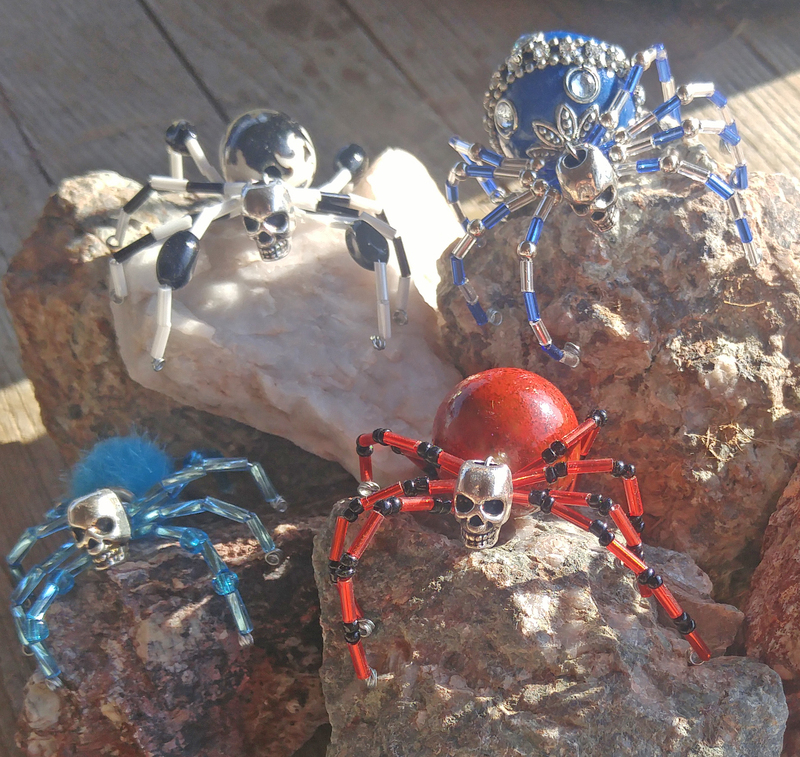 We had gone somewhere and seen these spiders displayed as Christmas ornaments. That year we made spider Christmas ornaments. We just continued making them and they kinda morphed over time. About 4 years ago, I was making a tree of life and I was wrapping the tiny skulls in the tree branches and my husband said, “Put a skull on the spider!”, and they EXPLODED! We can’t make them fast enough. I bet I make 500-700 handmade spiders per year. We sell in 3 retail shops. Tanga’s Natural Magick, Peoria, Arizona, Stone Goddess Designs, San Antonio, Texas, and The Jewelry Spot in Gatlinburg, Tennessee. My work is priced from $25 to $100. The sweet spot is $25 to $45. My work should be affordable for everyone. I make these little glass bottle charms. I fill them with rock chips. They can be worn on a necklace. I sell them for 3 dollars or two charms for 5 dollars. The family that comes by that has two little girls that doesn’t have a lot of money, they can buy both of them a necklace. Come to the 2018 Helzarockin’ Gem & Mineral Show to visit Lee Gonzales and lots of other talented artists!